FLASH is a most handsome boy - blue in colour, beautifully proportioned and muscular with the most gorgeous eyes which will melt your heart. He is young, being born in September 2013 and he has an amazingly sweet nature although still quite shy. 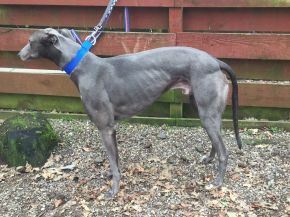 He is fantastic to walk on lead, is clean in his kennel and gets on with other greyhounds. He loves snuggling in and getting loving attention too. His confidence and true character will show through with patience, fun, love and experiencing new situations. He has a very strong bond with his sister, Cuddles and we would prefer to have them re homed together.